We can safely assume that the vast majority of those that oppose animal research do not have any qualms about vaccinating their children and companion animals or that, in case of an accident, would rush to the nearest emergency room to be treated with the benefits of animal research. Mr. Bogle doesn’t think so. In response he writes that to live true to our own challenge scientists must refuse all benefits obtained in ways we consider unethical as well. Namely, he challenges us back with: (a) not traveling on roads built by slaves — if we really oppose slavery, (b) refusing the care of a doctor whose education was based partly on knowledge obtained by Nazi physicians — if we truly oppose the Holocaust, and (c) for our daughters and wives to forgo gynecological care — as many of its techniques were apparently developed by Dr. J. Marion Sims using non-consenting human subjects. This is a flawed argument. It is clear that none of the unethical practices Mr. Bogle mentions are accepted nor widespread today. Thus, by traveling on a road built by slaves one is not actively supporting slavery. By accepting gynecological care, one is not actively supporting experiments in non-consenting human subjects. And so on. In contrast, the use of animals in medical research today is ubiquitous. Animal research provides medical benefits that translate into longer and healthier lives. There is a public demand for such benefits. If the desire for living longer and healthier lives vanished tomorrow, so would animal research, along with the rest of medical research. Mr. Bogle’s challenge rests on a false analogy. A proper analogy would be the following. Suppose you oppose child and forced labor practices and you discover that a particular US company manufactures its products overseas under such labor conditions. Would you still buy form such a company? Is there any way in which you can rightfully say that you morally oppose forced labor but are nevertheless entitled to benefit from the cheap prices the company has to offer? If you buy from such a company you are a hypocrite to the full extent of the word, as you are actively supporting, financing and perpetuating a practice you consider immoral. Ethical principles are supposed to guide one’s moral judgements. If you have strong moral principles you want to impart on the rest of society, you better be the first to be prepared to accept the consequences of such principles. Mr. Bogle and his ilk should stop benefiting from our research immediately. They should live by their beliefs, and we can help. Until then, they are nothing more than hypocrites. Posted on November 17, 2011 April 14, 2014 by darioringachPosted in Animal Rights NewsTagged ALF, Alliance for Animals, animal research, animal rights, animal welfare, Ethics, hsus, peta, rick bogle. However, I was reflecting on the personal harassment of researchers and their families. It is asking too much to expect even a person with an unambiguous animal welfare perspective to wholeheartedly endorse the concept of using animals in biomedical experiments. On a case by case basis, you could achieve agreement, but that is supposed to be the role of the institutional animal care committee. You want animal advocates to “openly acknowledge the need to use” animals but this is an overly broad demand, because even animal welfarists would prefer that non-animal alternatives be used. I am going out on a limb here, but I will openly acknowledge that it has been unfortunately necessary to use animals in the development of alternatives, for veterinary research, and in the achievement of certain biomedical research advancements, but that does not mean that I think animals should have been allowed to experience severe (or even moderate) suffering regardless of the importance of the advancement gained. My line in the sand is a certain degree of suffering––physical or psychological––that should not be exceeded no matter what the potential benefit. I do not think that is an extremist position. Whether it is a position that is doctrinally consistent with animal rights philosophy is irrelevant and, besides, there is no one philosophy of animal rights. Tom Regan articulated a different view from Peter Singer, and I don’t agree totally with either; Philosopher Bernie Rollin thinks animals can have all the rights they need while retaining the status of “property,” and I find that point of view fallacious as well as being uncomfortably reminiscent of the Dred Scott Decision. I am not an academic, but after 40 years of advocating for animal rights and welfare, as well as years of hands-on rescue of animals, I think I am entitled to argue my own point of view without having to defer to others. There are many issues involving animal rights and/or welfare on which there is not likely to be a consensus among advocates; controversy over euthanasia is more contentious than debates over the ethics of animal experimentation. It is intellectual dishonesty to proclaim or suggest that nothing has ever come from animal experimentation that couldn’t have been learned without research on animals. But it is equally intellectually dishonest to claim that there would have been no biomedical advancement at all without the compulsory use of animals in all forms and phases of scientific research. The employment of terror tactics is such a public relations nightmare for the animal movement that I find it difficult to believe that such activists really have the interests of animals at heart, unless they are in the throes of post traumatic stress disorder (which would not make it excusable but perhaps more explainable). I think it is more likely that those who engage in terror tactics are people who have found an outlet to express sociopathic or psychopathic tendencies on the fringe of a social cause. I think it is easy to “figure out why it is largely the scientists facing the bombs” and not participants in other categories of animal exploitation. Academic animal researchers are perhaps the group least likely to fight back with equal force. One reason may be that you have the most to lose professionally from even justifiable public brawling. If this is true, then it makes personal harassment of researchers seem all the more cowardly. Imagine what would happen if self-described animal activists tapped on the bedroom window of the child of an NRA card-carrying trophy hunter? They might be shot, and I think it possible that juries might consider it self-defense or other justifiable homicide. What would happen if activists showed up to harass adrenaline/testosterone-pumped rodeo cowboys? They would probably be beaten to a pulp. Once, in an argument with a hunter, I told him that if wanted me to acknowledge that there was any bravery in the sport of hunting that he should go after a grizzly bear with a knife. I would still think it the wrong thing to do ethically, but at least I would think the guy was tough. I would similarly challenge those who stalk animal researchers or demonstrate at their homes or their children’s schools to pick on hunters with weapons or rodeo cowboys who enjoy nothing better than brute violence and see what kind of response they get. I would still think it wrong to use terror tactics, but at least I’d have to admit they had some guts. But scientists would also prefer non-animal alternatives to be used if they are available! Let me rephrase — I think productive dialogue will most likely happen with those that acknowledge that in some areas of biomedical research there are presently no alternatives one could use and, so long as appropriate anesthetics and analgesics are used to alleviate suffering, and so long as the questions posed are scientifically important and stand a chance to advance a field of medical research, they will actually support the research instead of standing against it even if they had to acknowledge the ethical dilemma before them — the work is may be morally permissible even though it may not be morally right. I agree. Have you read the article I sent you? I point to sanitation and aspirin as two medical breakthroughs that did not involve the use of animals in research. We do both human and animal based research. The two complement each other. I doubt that personal attacks are on a 10:1 ratio on furriers vs. researchers. I’d like to see the data that Merritt has on this. As for the rest of your comments on violence — I agree with you. Looks as if the ratio is actually 10-1 against targets other than labs & researchers, with furriers and mink farms predominating among the others. The “other” category includes some attacks on animal control agencies, & some on retail stores where the intended target was unclear. The UK pattern is sufficiently different from that of the U.S. & the rest of the world that it needs to be looked at separately. The difference is in part because in the UK many of the issues are intertwined with issues of social class, which pops up even more in looking at non-ALF incidents, such as hunt sabotage. 1a) Animal researchers do not want to admit that anything ethically wrong has ever been done to animals in the name of science because that would make them feel guilty and seem vulnerable to criticism, even though the most grievous abuses of animals were committed by earlier generations of animal researchers. 1b) Animal researchers do not want to agree that there is a point––even a theoretical point––at which an experiment or procedure might cause so much unrelievable suffering to animals that it cannot ethically be done regardless of the possible benefit to the advancement of science (corresponding to the civilized view that it is wrong to torture prisoners regardless of what information may be gleaned), because an agreement to limitations being placed on the pursuit of science will take animal researchers farther down the “slippery slope” of regulation and moralizing by outsiders. 2a) The animal rights position holds that it is wrong to subject animals to experiments that cause them suffering or cause them to be confined in unnatural conditions, or which violate “their interests” in some other way. 2b) For animal rights advocates to agree that experimentation on animals has been useful to the development of modern medicine would seem to say that all the suffering might be justified, or at least they are fearful that animal researchers would twist any such admission into an exoneration of past atrocity. And so some activists are in a loop of denial of all benefit from animal research just as animal researchers are in a loop of denial that there could have been any medical advancement whatsoever without invasive experimentation on animals. 3b) Acknowledging that there might be any conceivable way in which animal research might be conducted that would not be a gross violation of animals’ “rights” leads to the animal advocates’ “slippery slope” of concessions and moral dilemmas. It may not be possible for an animal rights advocate to be FOR animal research, but perhaps it is possible to conduct animal research in a way in which an animal rights advocate might not be AGAINST it––just as one can be NOT AGAINST abortion and yet not be FOR it. The question is whether or not animal researchers would see a “not for but not against” position as being legitimate and conducive to dialogue––or would it be rejected as hypocrisy or moral ambiguity? Doctrinaire animal rights advocates might reject the idea but also might be able to tolerate it. First, I accept that moral boundaries are dynamic. Certainly, I think there have been some past experiments by scientists that today we would not approve of. Part has to do with the limited tools and drugs they had available to them and part due to their narrow understanding of animal cognition. Second, studies are evaluated individually as to their cost/benefit. Yes, there are some studies that are not approved because the cost does not justify the proposed loss of animal life. It is certainly not the case that “everything goes” as often claimed by our opponents. If only a few protocols appear rejected on the record it is because investigators know the approximate boundary after which committees will not find the protocol acceptable. Third, we all share this planet and there are bound to be conflict between the interests of different living beings. When we build a city and displace animals, we are putting our interests ahead of theirs. When we fly on an airplane or drive a car, we are putting our interests ahead of theirs. When we eat them, we are putting our interests ahead of animals. When we search for cures and therapies to terrible diseases, we are putting our interests ahead of the animals. I do not believe human interests always trump those of animals. However, I do believe there are so many instances where human interests are questionably put ahead of those of animals that I cannot figure out why it is largely the scientists facing the bombs and not the neighborhood supermarket or restaurant. Fourth, denying the benefits of the research is at best intellectual dishonesty. I find it impossible to engage in dialogue with those that deny the research has produces tremendously important findings and, at the same time, benefit from the work. Fifth, animal researchers do not enjoy harming animals. We do the research because we honestly believe there is no other way of obtaining the required information. We support the search and use of alternatives when these are developed. Lastly, you ask if I would see a “not for but not against” position as being legitimate and conducive to dialogue––or would it be rejected as hypocrisy or moral ambiguity? I do not think it is possible to conduct animal research that an animal rights activist would not be against, unless they misunderstand the philosophical theories underling “animal rights” views. This does not mean I wouldn’t talk to them. I will talk to anyone that is not trying to impose their views by means of violence, threats or intimidation. Actual progress will likely be achieved in conversation with those that want to advocate for the welfare of animals in laboratories but understand, and openly acknowledge, the need to use them in important areas of biomedical research, including the development of alternatives, and the benefits of the work. Animal People styles itself “animal protection” so as to encompass all issues concerned with animal welfare and rights. The line about individuals experiencing suffering and not species (as species is an abstraction), was not a reference to animal research/experimentation. Rather it reflects our position on debates involving endangered species or species restoration. We have taken a very strong position against the use of violence or tactics of terrorism in advancing the animals’ cause, but I really do not think we have ever taken a philosophical position on animal research/experimentation except to report favorably on progress in the 3Rs and also to report on issues involving veterinary research––for examples, anything to do with rabies vaccination or the development on non-surgical contraceptives for dogs and cats. Animal People has a board of three, and we all have somewhat different views, so when we editorialize about something, the editorial position is a synthesis of our views––a position reached after a lengthy dialectic process (an internal debate which may have gone on for years). In response to a question in the commentary following the article posted on this site about activist “hate speech,” I provided a list of things that I thought were achievable in advancing animal welfare in biomedical research/testing/etc. : changing the Animal Welfare Act to include all animals as animals; use of the 1-10 pain scale and requiring analgesia or anesthesia for procedures at, say, 4 and above; making what goes on in labs more accessible to the public (in understanding of the security issues); and reaching agreement that some procedures may cause so much suffering that they should not be done regardless of the possible benefit. The American public accepts the humane use of animals in experiments and testing, but they would not accept the “torture of animals” in experiments and testing. Just as civilized society has said that torture of humans cannot be tolerated regardless of the possible information to be gleaned, animals should not be tortured regardless of the possible information to be gleaned. If something would be considered torture if it were done to a human being, then it is torture if it is to be done to an animal with similar neurological systems (i.e. vertebrates, at least). My concerns are more with preventing suffering than with keeping animals alive, but that is not an organizational position. While it is fact that animals have been treated sadistically in the name of science (at least historically), I do not accuse any particular contemporary animal researchers of being sadists. I do not accuse any of you of being retrograde in your views. I find you all open to dialogue and to the idea of making further progress. Kim – thank you for your clarification and direct answers on the questions. The assumption is that Merritt is writing for a specific audience with a specific set of views (or biases). That is the nature of the publication. People wouldn’t subscribe if they didn’t like what they were reading or didn’t find it informative for their particular set of interests. This is not a newsletter geared to a geographic region. It is one based in a specific set of interests and defined point of view. The problem with Merritt’s discussion here is that he veers between an animal rights points of view and a retreat into claims of being an objective journalist. That clearly isn’t true and is obvious in many ways. I’m not going to read the entirety of Animal People because I do not have time– I also do not expect you to read the entirety of Speaking of Research or the entirety of the scientific literature. But what I would ask is whether your newsletter publishes anything at all on the animal research — basic and clinical — that is the source of progress and improvements in treatment for both human and nonhuman animals? I can tell you that Speaking of Research does this and also discusses the work that the scientific community does to continue improvements in laboratory animal care. Like you, I am a mother, feminist, and animal welfare advocate. I am also a laboratory animal researcher and believe that we still need animal studies in order to make progress for human and nonhuman animals. I do not believe that we can do our best to protect the health and welfare of current and future generations without using animal research. Maybe you do. If that is the case, what would facilitate the dialogue is to provide examples of that, or information about how you see this happening. Among the oldest of propaganda techniques used in defense of regimes which no longer enjoy public support, if they ever had any, involves the defenders looking for what they believe may be the least popular element among their opponents and then trying to portray all of their opponents as being of that element. In the present instance, practitioners of particular types of animal experimentation, which are not representative of all or even most animal experimentation, and enjoy little if any public support, are defending themselves by hiding behind the types of work that they do not do. They are at the same time attempting to portray all of their critics as “terrorists”; equate “terrorism” with “animal rights” philosophies, even though practically all animal rights philosophies categorically exclude the use of violent tactics; draw a false distinction between “animal rights” philosophies and support of “animal welfare” goals, which have time and again for more than 20 years have been discovered by surveys to be shared in most essentials by about 85% of animal advocacy donors; and deny the reality that nationwide, about one household in four responds not only to appeals on behalf of hands-on animal welfare projects, but also to appeals in pursuit of “animal rights” goals, if “animal rights” is defined as restraining or prohibiting using animals in ways that cause them suffering, simply because it is expedient. The animal advocacy donor base, broad as it is, is meanwhile only about a third of the actual base of support in public opinion, as demonstrated by a variety of public opinion surveys and responses to ballot initiatives, especially pertaining to farm animals. Most Americans, Europeans, Chinese, Hindus, and Muslims — among others — express a belief that certain types of animal use are unacceptably cruel and should be prohibited, regardless of rationale. As the animal experimenters define “animal rights,” “animal rights activists” would thus appear to include the mainstream majority positions worldwide on many relevant issues — which of course would greatly surprise the many authentic & committed animal rights activists, who are used to believing themselves to be a minority. The pretenses and misrepresentations made here by animal researchers remind me in rhetorical structure of the arguments of several recently deposed Middle Eastern potentates that their opponents were all “Islamists,” and that “Islamists” were all to be equated with “al Qaida.” Some were; most were not. Meanwhile, rather than undertake the necessary reforms that might have kept themselves in authority a while longer, the defenders of each regime persisted in false equations, spurious analogies, and games of “what if,” until they had no legitimacy left with anyone except themselves. Merritt Clifton and I are cofounders of Animal People and together we produce the ANIMAL PEOPLE newspaper, but when it comes to philosophical or moral opinions, we are often at odds. Unless something appears as a page 3 “editorial” in the ANIMAL PEOPLE , it should not be considered as a policy statement of the organization. Merritt’s postings represent his point of view and my postings represent mine. Animal People is a 501(c)(3) animal protection charity and an advocacy organization, but Merritt prefers to consider his role in it to be that of a hired journalist who writes articles and reports the news. By contrast, I consider myself an animal rights advocate who gravitated to a role in humane education and publishing. I am also a mother and a feminist who doesn’t think abortion is a humane concern unless the fetus has reached the stage of sentience. I see you consider yourself an “animal rights” advocate. But do you consider “Animal People” an animal welfare or animal rights organization? The statement in your front page “”The humane cause is about preventing suffering. A species does not suffer; individual animals suffer.” is effectively an animal rights position. It would also seem strange for an animal rights advocate to be running an animal welfare organization. I would fully agree with your first statement “The humane cause is about preventing suffering”. That’s what scientists are trying to do. In fact you will find that most scientists will also agree with your animal activism in areas that do not overlap with medical research. (Yes, I voted for Prop 2 in California). Your second statement appear to ignore the fact that the capability for suffering is not the same across species. Sentience is not the only morally relevant property nor an all-or-none characteristic. We would disagree that we owe the same moral consideration to all living beings with some minimum level of sentience. Actually, you were engaging in a discussion of abortion and through your choice of words were conveying a viewpoint that was hardly neutral. You’re a journalist, you know exactly how framing and word choice work. It is a little unfair to start out that way and then refuse to articulate your position. You’re using a similar tactic in your discussion of animal research. You claim to have no agenda or slant in viewpoint and at the very same time reveal exactly that in your choice of language, arguments, and examples. Summarizing from your comments above: Animal People is a community paper whose topic is caring about animals, you’re an objective journalist charged with getting news about animals (really, focused on nonhuman animals) and it seems to be really important to you to maintain some appearance of objectivity. So in your journalistic work you have surely encountered animal research that benefits both human and non-human Do you share that with your readers? You must also be aware of a great deal of variation in the types of animal research performed today and the types of laboratory conditions. Do you write about and support some research and not other types? For those who have questions about the content of ANIMAL PEOPLE, the answer is simple: read it. I am not engaging in a discussion of abortion. I summarized the major point of public conflict concerning it, which has been defined by many thousands of others, on all sides of the issue, over the past half century. @Merritt Clifton. You totally dodged the question there. It was pretty straightforward too. Somewhere above you are the person that introduced the term “backstop birth control” and a discussion about the role of public opinion on women’s reproductive choices. “Backstop birth control” is not really neutral language. And your use of that language, that tactic in discussion, and the complete non-answer to a simple request for clarification of your position really suggest that you are not giving an honest effort towards dialogue. Fine to advance your cause, but kind of silly to pretend as though you’re not doing that when it is so obvious. I am not here to participate in what I regard as a rather pointless rhetorical debate, the outcome of which is unlikely to affect either public opinion, public policy, or the personal conduct of either alleged mad bombers or alleged mad scientists in any manner whatever. I am here because several times, at points several days removed, I have been asked by several different people who are participating, or observing, to furnish information, both factual and contextual. This is my only interest in this discussion. I have not taken any advocacy position beyond pointing out the respective positions of some of the participants relative to each other and the norms of society. As a contextual judgement call, as previously stated and based on the facts of the issues, I do not believe many of the researchers who have been attacked for what they have done or tried to do to animals, have any claim to higher ethics or morality than their attackers. Society has an interest in preventing bombings and arson, regardless of pretext; society has an interest in preventing cruelty to animals, regardless of pretext; and society also has an interest in ensuring that no one feels his or her interests warrant blatant and violent transgressions of either personal rights or behavioral norms. In my view, again as stated, and again as a contextual judgement call, the mad bomber and the mad scientist are much the same in their claim that purported “higher” ends provide a warrant for cruel and unethical behavior, which is easily recognized as such when presented to people other than the participants. Comparably, I don’t have a favorite baseball team. If I had one, it would be not the men in white, nor those in grey, but those in blue, who make judgement calls not to determine who wins or loses, but rather to ensure fair conduct of the game. As a point of contextual information, we are all the longterm beneficiaries of a great many past actions and practices which were cruel and unethical, including rapes which contributed to our gene pool, genocides which provided the land we occupy, and quite a lot else. That we are each among the ultimate beneficiaries of such history, and may even have been participants in some of it, whether willingly and knowingly or otherwise, in no way rationalizes not seeking and practicing less cruel and more ethical ways of life going forward. So in your ethical book the work of a medical hero, such as Albert Sabin, has the same moral standing as the lunatic animal rights criminals that plant bombs at our homes. I am sorry, but I don’t think you have spent enough time thinking about the moral issues, but it is also now clear you do not want to discuss it either. So much for your willingness to put the rationale for those that are in favor and against animal research in the court of public opinion. And society has also an interest in advancing our health and well-being, to live longer and healthier lives with our loved ones, in finding cures to horrible diseases like cancer, Parkinson’s, Alzheimer’s, autism, and so on. It is because of these societal interests that our government funds medical research (some of which includes animal work). It is because of this societal interest that scientists do the work that they do. It is in part because of such efforts, that we live 25 years longer than our grandparents did. It is sad to see your compassion limited to non-human animals. There is a deep, anti-human sentiment in some animal rights activists that is difficult to swallow. Let me break the news to you — you are no animal welfarist, you are an animal rights activist. I think you already knew that. As previously stated, I am journalist. Activists commit activism. I commit journalism, on a beat and for an audience which includes the broad spectrum of people who care about animals. As to the rest, ethical conduct includes accurately representing the remarks of others in responding to them, including in context. Such a contextually inaccurate commentary warrants no response. You commit journalism? Is that a joke? You may be a journalist, but neither here nor in “animal people” you are presenting a balanced view of both sides. You are an activist. An animal rights activist. Perhaps you should start by accurately representing yourself. The rest of your comments warrant no response because they lack any content relevant to our discussion. @Merritt Clifton. Are you endorsing the viewpoint that the “court of public opinion” ought to take precedence over a woman’s right to make decisions about her own health care and reproduction? Or making the simple observation that some of the public believes it should control the private decisions of women? You align yourself with ANIMAL PEOPLE, which is clearly not neutral on issues related to animals. Here a contextual point needs to be made about the practice of journalism, and the role of ANIMAL PEOPLE. First of all, “be kind to animals” is a basic societal value which exists all over the world, within every major religion and culture, and has been articulated in ever expanding form at least since the dawn of written language. “Be kind to animals” is even accepted as a basic value, albeit much contextually nuanced, by most people within animal use industries, including laboratory use. ANIMAL PEOPLE, like any community newspaper, upholds the broadly accepted values of the community. Our editorials, like the editorials of any community newspaper, address the issues of concern to the community, from a synthesis of often differing perspectives among the founders. The ANIMAL PEOPLE subheading is simply, “News for People Who Care About Animals.” This — “people who care about animals” — is as narrowly as we care to define our community. You stated that “that might does not make right” I merely asked if you felt this was under all circumstances. This, of course, is the position of animal rights theorists, who believe harming other living beings is morally wrong in all cases. I asked if you agreed with such position and it is you that ran away from the question. I explained that we (scientists) feel a moral obligation to use our abilities to understand Nature to minimize suffering in the world. If you don’t agree that is fine, but you should state your position clearly so the court of public opinion, as you said, can understand the basic differences in our ethical positions. I am not a pacifist. I think the violence from animal rights groups is unfounded because their moral principles are wrong, not because violence is never necessary to impart justice. Yes, I think it was necessary and morally justifiable to use violence to remove Hitler from power. It is only if you believe that in a full moral equivalence between human and non-human life that you can advocate the use of violence to stop the so-called animal holocaust. So do you align yourself with Francione (pacifist and animal rights) or what exactly? I don’t debate hypotheticals, period. But, pertaining to Hitler, fair and accurate reporting on the part of Dario Ringach would note that I did not raise the question of using force to defeat Hitler. That was not the issue. What I did was summarize the rhetorical question often asked by defenders of violence against animal researchers as to whether it would be ethical to travel back in time to assassinate Hitler in say 1933, or 1928 — and I pointed out that this sort of discussion is as sophomoric and irrelevant as the old saws about “a mouse vs. a cure for cancer,” “your child or your dog,” et al. Concerning Gary Francione, I have reviewed several of his books. He did not like the reviews. You can find the reviews at the ANIMAL PEOPLE web site, or provide an e-mail address & I’ll send them directly to you. Sure, you can email your reviews of Francione to dario@ucla.edu. Perhaps those will shed some light on your moral stance. You seem unable to articulate your ethical principles. A public debate on these complex issues requires you put on the table the moral precepts you want society to adopt and follow. The same is being asked of scientists. Hypothetical scenarios are typically used to test the limits of moral theories in the literature. The reason you don’t want to discuss such scenarios, it seems to me, is that you don’t like the outcome your moral principles lead to. Instead of accepting the obvious conclusions that something in your principles that is in conflict with your moral intuition, you run away claiming that journalists do not align with anyone or anything. This is utter nonsense. You are simply running away from the public debate you so eagerly wanted to have. The biggest myth here is the presence of suffering in biomedical research laboratories. Merritt’s portrayal of our work is as contextually inaccurate and riddled with errors as he argues the assertions of others are. Indeed, a very large amount of all research (probably the majority, in fact) involves no pain or distress in the animal subjects at all beyond that of a blood draw or quick injection – things we make our children to do for their own good and that of the population. In the vast majority of the remaining studies, there would be pain (for example, in response to a surgery) except effective pain killers are used to prevent it, so there isn’t. Only the tiniest minority of studies involve unalleviated pain or distress, and those studies are only approved when there is no other way to conduct the study and only when the objective of the study is to address and alleviate a serious health concern affecting humans and animals. On this website, we have described the work and accomplishments that we, and others, have undertaken. We have described our research and its methods to the media and to the broader public. We write IACUC protocols and have published papers that describe, in great detail, exactly how our studies are performed. Merritt would have you believe that he doesn’t support attacks on scientists, but his words are disingenuous. Like so many others, he repeats the same tired melody. He says he doesn’t support harassment and violence against scientists, but he certainly takes every opportunity to advocate for the fact that we deserve what we get. Ultimately, the lies, fabrications, threats and misinformation posted here are meaningless. The work, and its application to human and animal health, are too important to be affected by violence: either the threat of it or the pathetic justification of it. Cancer, autism, HIV/AIDS, addictions, tuberculosis and the like are the enemies that actually matter to scientists and society, and we will never lose our focus on them. David Jentsch should have read some my coverage of animal research issues, not only in ANIMAL PEOPLE but in peer-reviewed media serving professionals in the public health, occupational safety, and zoonotic disease fields, before proceeding to name-calling. At public issue are not those animal studies which most people find acceptable, under qualifying conditions including relief of pain and strict accountability of the scientists to outside supervision, but rather those studies which inflict suffering that most people do not find acceptable, and tend to find ever less acceptable as the experimenters labor ever harder to argue that they should be exempt from the same standards that are applied to anyone else who harms an animal. These are the studies, whether they involve 1% of the animals used in research, 10%, or a tenth of a thousandth of a percent, that incite legislation, litigation, and protest, including the rare instance of violent response. Of note is that while most of the leadership within animal advocacy long ago rejected the use of violent tactics, and drummed those who use or espouse them out to the smallest groups on the farthest fringes of the cause, advocates of animal research have done relatively little to separate themselves from those few whose work — because it is difficult to explain, rationalize, and countenance in any guise — occasions most of the protest. Instead, what we see are attempts to protect the atrocities with blanket defenses of the entire research field. Experiments which basically torture monkeys for five days and then kill them, in lieu of developing better non-invasive methods of discovering the same information of no immediate use, are lumped together with vaccine research in which live animals are used only in the last stages before winning regulatory approval and deployment to save lives. One irony of using such blanket defenses is that that sort of argument fuels much suspicion and rejection of the entire research field. First, if you want to see some of the details of some animal experiments you can go to any public university and gain access this journal — http://www.jove.com/ where you have videos of many different procedures. Second — I repeat, I support increased transparency… but this a position it is difficult to argue for when you have lunatics playing with fire. Third, you seem to have excellent credentials as an investigative reporter. So here is one way in which your talent can be useful. Can you solve any of the following crimes? Putting these criminals in jail will certainly be a good way of fostering dialogue and transparency. The incidents to which Dario Ringach refers, with links to reportage, were also reported in the July/August 2008 edition of ANIMAL PEOPLE. And ANIMAL PEOPLE had already, since inception, made very clear that we have no use for arsons, bombings, or any similar tactics of intimidation. I have pointed out not only editorially but from the podium at national animal advocacy conferences that the animal cause is a part of advancing a greater recognition that might does not make right, and that use of violent tactics is fundamentally contrary to the greater goal. I have also pointed out from the podium that a vivisector experiencing burns with shattered glass in his eyeballs is just as much a suffering animal as the animals whom he may subject to similar treatment in his laboratory. Causing suffering is not the goal, no matter who is caused to suffer, or why. This is why the abolition of torture and public execution were as prominent as goals of the early humane movement as the abolition of vivisection, and receded in prominence in humane advocacy only after receding from open practice. With that much said, it is precisely because I am familiar with many animal experiments and methods that I do not believe many of the researchers have any claim to higher ethics or morality than their attackers. Institutionalized abuse is no less abusive than vigilantism, but does typically involve far more victims. Thus I have also often remarked that in my view the mad bombers who torture scientists and mad scientists who torture animals are flip sides of the same coin, each claiming to act for a higher purpose not perceived by most of the rest of us. Both belong in the same prison cell. Useful discussion begins with discarding the pretense that “higher” ends warrant the use of atrocious methods to obtain them. Am I right to interpret that if we could cure cancer by doing an experiment on a mouse that you would oppose on ethical grounds? Humans can indeed understand and manipulate nature in ways other animals cannot. Recognition of such ability (our might) creates an ethical dilemma — should we try to cure diseases using animals if we can or not? You emphasize the suffering of the animals, but you discount the the alleviation of both human and animal suffering the research generates. Do you consider yourself an animal welfarist or an animal rights activist? I’m a journalist. And I recognize a specious retreat behind empty rhetoric when I see one. As a postscript, by way of elaboration, the “suffering of a mouse vs. a cure for cancer” argument is the inverse of the argument I hear at times from defenders of violent tactics about whether or not one should assassinate Hitler to prevent the Holocaust, if one happened to have the ability to travel back in time. In the real world, we are not dealing with such reductions to absurdity, and such sophomoric exercises add nothing to anyone’s understanding of anything. But you fail to understand an important asymmetry here. Honest and civil dialogue can happen if and only if everyone feels they can speak freely. These bad scientists do not represent an obstacle to dialogue, while animal rights extremists do. You might have noted that the large majority of scientists that are speaking up are those that have been under attack from extremist groups. You can distance yourself from these groups, but we can’t. We welcome your anti-violence statements. That is a good step. But such statements alone will not create the conditions where dialogue can occur. As a journalist, I distance myself from everyone. I also happen to be constantly taking flak from many of the same fringe people & organizations who concern Dario Ringach et al — and from equally hostile people who don’t like my perspectives & reporting on many other controversial topics, including pit bull terriers, sport hunting, animal slaughter & sacrifice, on & on. I don’t construe that stuff as any obstacle to dialog. Often it’s the beginning — if not with the most hostile folks, then with the others who see the nasty stuff & wonder what it’s all about. I work in the public arena, & have for more than 40 years. Almost everything I do is in print or online, open to public scrutiny, criticism, the possibility of lawsuit, even attack. From that perspective, I have no sympathy — none — for people who believe that they cannot do whatever they do out in the open. If there is an experiment you cannot do in front of a window, or at least on closed circuit TV, because some people might find it unconscionably cruel to animals, you really should be figuring out another way to get the information — just as journalists do, usually, in lieu of using the sort of methods that recently landed Rupert Murdoch in hot water, since his methods don’t pass public scrutiny. Ultimately we all answer to the court of public opinion. But there are always some folks who think they should not have to, usually claiming some sort of higher motive or purpose which they believe should confer an exemption. History does not tend to judge such people well, no matter what they have done or discovered. I have no interest in your competition about who has more death threats. The point is that scientists are not the ones issuing death threats, planting bombs under cars, nor threatening children. Honest and frank dialogue will happen only when everyone involved can speak up their minds. Everyone. Not just those that claim to be immune to death threats. Viewing violence as fostering dialogue is truly absurd. Yes, I would support a call for more transparency… but, out of curiosity, would you also demand glass windows in front of abortion clinics? Except that sometimes scientists & their allies turn out to be the mad bombers, because maintaining the image of being under siege very much serves their political & economic interests. Some of us well remember how U.S. Surgical in 1988 hired two agents provocateur who induced a mentally ill woman to leave a bomb in the U.S. Surgical parking lot, going to the extent of pretending to be her best friend and a casual boyfriend, paying for the bomb, & driving her to the scene. Kim Bartlett & I — and HSUS president Wayne Pacelle — happen to be familiar with the tactics involved because provocateur Mary Lou Sappone made the rounds of a January 1988 gathering we all attended, trying to interest the attendees in the plot. Kim (whom I had not yet met in person) fingered Sappone right away to others as a agent provocateur. Sappone outlined her ideas at greatest length to me, in a different room from Kim, as I later detailed in testimony during related litigation. Sappone was apparently unaware that I was & am a journalist. I told her that her whole bombing scheme was half-assed stupid & self-defeating, mistook her for a drunk, & told others who appeared to be her friends that she should not drive herself home. That was scarcely an isolated episode. In June 1990 a series of bombings in Britain wrecked two researchers’ cars and severely injured a 13-month-old boy. Defenders of animal research played up the bombings for all they were worth — I still have a thick file folder full of clips about the case. But that series of attacks ended after South Somerset Hunting Preservation Group and British Hunting Exhibition founder John Newberry-Street, then 51, confessed to setting up hoax bombings “to discredit the animal rights and hunt saboteurs organizations,” and was sentenced to serve nine months in prison. Meanwhile, in 1987, an arson at a nearly completed animal research lab at U.C. Davis was attributed to animal rights activists, but 24 years of investigation have not produced a credible suspect. The major outcome of the case was that suddenly biomedical researchers were able to get funding for increasing the security of research facilities, which they had not had huge success in doing when the major stated reasons were becoming able to do advanced experiments with recombinant DNA & scary diseases. In 1990 the biomedical research industry invented & amplified from whole cloth the allegation that an animal rights activist had assassinated Dean Hiram Kitchen at the University of Tennessee in 1990. Kitchen was actually on friendly terms with several prominent animal advocates. I talked to all levels of law enforcement about the case. No one, at any level, ever suspected the murder was ideologically motivated. The prevailing theory was that the murder resulted from an attempted stick-up. So let’s not have any violins about how animal researchers are all sweet innocents on the mayhem front, especially when it is in fact animal researchers whose frequent mayhem inflicted on animals has provoked the whole issue in the first place. Instead, suppose we turn back the clock a bit. During the 18th and 19th centuries a huge amount of animal experimentation was done right out in public — and the researchers even sold tickets to the performances, since NIH grants were not yet available. The only restraints on what could be done to animals in those days were whatever the public would tolerate. This of course was also an era in which dogfighting and animal slaughter for human consumption was also done right out in the open, without restraint, along with the conduct of public execution. At a certain point, largely through the influence of the early humane movement, most of the public in much of the world expressed revulsion against the proceedings. In response, animal researchers did exactly the same thing as the dogfighters, slaughtermen, and executioners — they moved the proceedings indoors, & took measures to prevent anyone from witnessing what was done who might disapprove. But animal researchers also introduced a twist: they sought to involve every child in cutting up animals in experiments, from as early an age as possible, making no bones at all about the belief that if every child participated in classroom dissection, as adults they would endorse and support animal research of all types, at all levels. I have reams of material here from advocates of classroom dissection, who have made these arguments since the mid-19th century & are still making them wherever classroom dissection meets opposition. What happened as result of mandatory classroom dissection, though, was that by obliging generations of children to perform cruel, redundant, and scientifically useless “experiments,” the animal research industry managed to persuade generations of people through direct experience that animal research consists of little more than uselessly torturing & killing animals. Now animal researchers don’t like the consequences, & argue for even greater secrecy, plus protection from not only the handful of violent crazies, but mainstream public opinion. The bottom line is that yes, there are violent crazies at the fringes of animal advocacy, just as there are crazies in animal research who mail envelopes of anthrax to people. But the issue is not about the fringes. The issue is about the central activities of animal experimentation and protest against it. In either instance, if the activity can pass muster in the court of public opinion, it can & should be done in public. If it cannot be done in front of witnesses, the practitioners are choosing themselves to belong to the realm of crime. Incidentally, there are glass windows in front of most abortion clinics. That’s because they happen to be hospitals, and the abortions performed by most hospitals, for the reasons acceptable at most hospitals, are relatively non-controversial. The sound & fury surrounding the abortion issue — despite the attempts of activists on either side to widen it — has always pertained primarily to the use of abortion as backstop birth control. From the days of backstreet “coat hanger” abortion to the present, this has almost always been done in secret for the fairly obvious reason that it has never had wide public approval. If abortion as backstop birth control was widely accepted in the court of public opinion, there would be neither the perception that it must be done in secret, nor the throngs of sometimes violent protesters who have made abortion the flashpoint political issue that it is. I hope Dario Ringach maintains a more scrupulous regard for accuracy in his research than he just did in summarizing my comments. I did not object to Martosko’s “style”; I pointed out that while his specific facts were mostly accurate, he presented them far out of a fair and accurate context. I did not comment on whether most of the many individuals whom Martosko named held (or hold) positions in animal welfare/rights organizations, other than their own, but if I had commented on that aspect, I would have pointed out that most have never held paid employment with any animal welfare or rights organizations other than those they founded; several of those who were at some point hired by other animal welfare or rights organizations failed to survive a probationary period (usually 90 days); and I believe the organization that both hired and fired the most of them was PETA. Bluntly put, loose cannon do not make good employees, and PETA is as aware of that as anyone else who has employees. Martosko and his supporting documents named about 40 people altogether. At any given time the galaxy of paid employees of U.S. animal rights & welfare organizations is approximately 45,000. Subtracting the people Martosko and his supporting documents named who have never been employed by animal rights or welfare organizations leaves a ratio of about one named person per 3,000 employees. Could we find a similar ratio of people who commit violent acts among laboratory animal researchers, exclusive of actions committed in the name of research? In at least one category, murder, we can probably find more. I am aware of one animal rights activist who has committed murder during the past 30 years. This was a mentally ill woman who “euthanized” her child and then attempted suicide. I am aware of at least five U.S. animal researchers and animal research technicians who have committed murder during this time. Convicted were William H. Douglas, Amy Bishop-Anderson, Raymond Clark III, and Sinedu Tadesse. Bruce Ivins committed suicide; the FBI believes he murdered at least five people. Mostly, I believe, that if you have a large enough pool of people, some of them may do just about anything. Bit of a false comparison Merritt, the crimes to which Martosko referred were those linked to AR activities, I’ve no doubt he would have found a lot more crimes if he started looking at peoples general criminal records. That’s presumably why his list didn’t include the child murder you mentioned, it wasn’t part of any AR campaign. Same applies to the murders by scientists and research technicians you refer to. Given that the murder rate in the US in 2010 was 4.8 per 100,000, and that there are at least 50,000 animal researchers and technicians in the US (and possibly twice that, I don’t have the precise figures), the 5 murderers and 9 murders over a period of 30 years seems low compared to the 100 or so in the general population in the same period, perhaps less than 20% of the national average. So if these are all the murders committed by those involved in animal research in the past 30 years -and in Sineedu Tadesse’s case this involvement was very slight – than it actually suggests that those who are involved in animal research are a lot less likely than the average Joe Blogs to commit murder. This wouldn’t surprise me, the kind of temperament and ideals that pushes a person towards a career in biomedical research is unlikely to predispose them towards violent crimes. And the nine killings by five animal researchers & research technicians that I mentioned all involved the use of animal research lab facilities, resources, and techniques, and/or killing co-workers. That’s why they came to my attention. Sorry, I can’t just let you get away with that. I expect better from a journalist than such inaccuracies. Sinedu Tadesse was a premed student – not an animal technicial or animal researcher -who used a kitchen knife to kill her roommate, before she hung herself. Tadesse was clearly mentally ill, and there is absolutely no evidence that any lab experiments she may have performed that involved animals played any part in her breakdown…which seems to have been the result of a lifetime of isolation from her peer groups. Amy Bishop-Anderson went postal, she used a gun to kill and wound her colleagues. Now I really doubt that working in a post office is particularly likely to make you want to kill your colleagues, but the association has, perhaps unfairly, stuck. Are all postal workers potential mass murderers because of the job they do? Probably not, and to imply that they are would be as foolish as using murders that just happened to be committed by people who were (in some cases tenuously) involved in animal research. The murder of Annie Lee by Raymond Clark III is another case in point, are you implying that every employee who has murdered a colleague after becoming obsessed with them does so because of the nature of their job? It’s utter nonsense. the murder committed by William H. Douglas did not involve “the use of animal research lab facilities, resources, and techniques, and/or killing co-workers” and he also did a lot of cell culture work…so perhaps we should imply that cell culture causes people to become murderers! Bruce Ivins appears to have sent anthrax to people (resulting in several deaths) because he felt that politicians were not taking the threat of bioterrorism seriously enough , and perhaps because of his social and religious views (very anti-Muslim), and again don’t seem to have anything to do with his animal research. but only when you are talking about the more random criminality described above. When it comes to the crimes committed by AR extremists -which have resulted in serious injury on several occasions in the UK and almost resulted in death or serious injury in occasions in the US, not to mention the distress caused by damage to peoples property – there is a clear pattern. It is also clear that there is a sub-culture within the broader AR movement that supports and encourages the actions of the extremists. As a point of factual information, William H. Douglas was convicted not only of murder, but of embezzling $67,000 from the Tufts University laboratory at which he was employed, used in pursuing the relationship with his victim which ended in her murder. If the recollect of events is wrong, who cares? Write it off to misunderstanding. Why not forget whatever contentiousness there was in the exchange with HSUS and just try to move forward now? Who said what to whom doesn’t matter in the greater scheme of things. Don’t create further obstacles if you really want a dialogue. Back to the discussion of the Martosko “testimony,” wasn’t his Center for Consumer Freedom against restrictions on smoking cigarettes in public as well as against animal rights? Factions need to be careful of thinking that if someone is the enemy of their enemy then he must be your ally. The biomedical research industry in India politically allied itself with Kali worshipers and other animal sacrifice proponents so as to wrest the animal welfare portfolio from cabinet minister Maneka Gandhi, who was trying to institute restrictions on animal experimentation that would be similar to what exists in the U.S. today. We do not associate with Martosko’s group. I simply asked what factual errors were in that document. Merritt responded that “most of Martosko’s testimony is quite accurate”. He objected to the style but did not point to any factual errors. The individuals described might be “the fringe of the fringe”, but they held positions in mainstream animal welfare/rights organizations. As for HSUS. I am sorry, their recollection of the events is incorrect. I believe the video and/or transcript will be made available soon and that will settle that story. I will post a transcript of my comments as well. “The very foundation of The HSUS’ work is to protect animals from suffering and cruelty caused by human actions. Any tactic or strategy involving violence toward people undermines the core ethic we espouse. Such tactics are ethically wrong and do fundamental damage to the credibility of the humane movement. Since The HSUS was founded in 1954, we have never engaged in or supported any form of violence done in the name of protecting animals. I am told by HSUS that it was you who rebuffed an offer to move the dialogue forward after the OLAW/USDA conference, so obviously there was a misunderstanding between you and the HSUS representative. Why not try now to establish a civil discourse, putting aside past misunderstandings and hard feelings that may have existed on both sides? If Bogle has had his throat swabbed for bacteria lately he really is a hypocrite. Not to mention pregnancy tests, anti-coagulants, and on and on…. Most of Martosko’s testimony involves information that was exposed earlier in ANIMAL PEOPLE, and was strongly criticized, years earlier. Most of Martosko’s testimony is quite accurate, so far as it goes, but of course he puts the anti-animal advocacy spin on it that suits the purposes of his organization, and overlooks many. contextual points of note. On the silly side, my understanding is that then-Humane Society of the U.S. president Paul Irwin thought WASTE was a recycling group when he sent them several very small grants. No one has written more exposes of Paul Irwin’s regime at HSUS and his subsequent involvement in animal advocacy than I have; but the only time Irwin has spoken to me in 23 years now was to praise the January 1994 ANIMAL PEOPLE editorial denouncing violence in the name of animal rights. Irwin co-authored the 1990 HSUS/ASPCA/MSPCA joint denunciation of violence undertaken in the name of animal advocacy, & right up to his last involvement in animal advocacy about three years ago, Irwin urged mainstream animal advocates to distance themselves more clearly from the lunatic fringe of the cause. Except for the involvement of PETA, all of this stuff from Martosko involves the extreme fringes of the most extreme fringe of the animal rights cause, many of them people with little or no link to actual pro-animal work. Some of them might be characterized as career ideological drifters, just looking for a cause, any cause, in which to vent sociopathy. Much of Martosko’s testimony labors to promote the image of connections that don’t exist. HSUS president Wayne Pacelle, for example, poses at conferences for photos with all sorts of people, most of whom he barely knows, if he knows them at all. That Pacelle is in a photo with anyone means little or nothing. I believe the allegations pertaining to Compassion Over Killing founder Miyun Park are also spurious. Miyun Park, now executive director of the Global Animal Partnership program associated with Whole Foods Markets, knows a lot of people, as do many of us, & some of them are nut jobs, which could be said of the acquaintances of just about anyone, but her own approach has always been to try to work within the system. Also of note, longtime ANIMAL PEOPLE reader Cathy Goeggel of Animal Rights Hawaii, whose name appears in Martosko’s supporting documents, supports civil disobedience, but does NOT support violent actions, and never did. At some point at a conference she agreed to be on a committee that she thought was all about one thing & then it turned out to be about something else, so she disassociated herself from it. Goeggel called me about it at the time, upset that she was linked online to people she did not know, whose actions she did not support. I recall quite clearly how & when J.P. Goodwin broke with the ALF et al, within days of his last announcing an ALF action, I believe in early May 1997. It is quite unfair and inaccurate at this point — and was in 2005, when Martosko spoke — to identify Goodin with perspectives and activities that are quite opposite to everything he has stood for during the past 13 years. I had known Goodwin since he was 17, when he requested a copy of an economic study I had done of the fur trade. I had given him several Dutch uncle talks by telephone & e-mail over his support of violent actions. Goodwin was overtly hostile to my views at the time, but remained in touch for whatever reason. By the time bombs began going off in Utah, half a dozen years later, he was both a leading ALF spokesperson and increasingly rattled, in private conversation, by things being done in the name of animal rights & ALF that he more & more felt were just plain wrong. Finally, very early one morning, J.P. called to say that the Straight Edge bombers were “@#$%ing crazy,” and that he was “totally done” with anything of the sort. And he was. And many times in the ensuing years Goodwin has been the one who has been able to talk young hotheads out of undertaking violent actions. I understand that another former ALF spokesperson, Freeland Wicklund, has done similar, but have not remained as much in communication with him. Wicklund took a public turn against the use of violent tactics in 1996, just a few months after I debated the use of violent tactics against him at Antioch College in Yellow Springs, in front of perhaps the most hostile audience I have ever addressed. Except for two fellow journalists in the audience, I didn’t think anyone was listening, but several other audience members later mentioned that the debate was a turning point in their lives. I should mention before concluding that I have myself received many anonymous death threats & such from supporters of violence in the name of animal rights, especially in the 2005-2006 time frame. The first time one claimed to actually be “on the way to shoot your head off” was in August 1992. I have also received quite a few such threats from hunters, trappers, pit bull terrier enthusiasts, & a variety of other categories of animal users & abusers. My responses tend to be short & obscene. Sometimes some of the ostensible animal advocates have grown up, matured, identified themselves, & apologized. Nobody made them do it. They just chose for themselves, like Goodwin, to go another way. I am not familiar with that “testimony,” but will endeavor to find out what I can about it. That it was presented to the U.S. Senate does not make it accurate. Let me know what factual mistakes you can find in this testimony. I am aware the individual who presented this information can be said to represent the interests of others (restaurants and food companies), but the links appear to be well documented at the end. I guess you automatically delete email or website addresses, but you can reach me by googling ANIMAL PEOPLE. As I’ve said before, that activists purporting to be members of a humanitarian movement should engage in violence, threats, or harassment of individuals (most especially children) is an outrage. My organization, Animal People, has condemned terror tactics and called for civil discourse. I think that if you ask, you will find that the major animal groups (HSUS, ASPCA, Friends of Animals) have policies condemning the use of any form of violence to advance the cause. I don’t think that PETA ever advocated violence. There is one conference series that permits discussion of what I would call tactics of terrorism, but none of the major animal groups participate in that conference series any longer, because they disapprove and do not wish to be a party to it. What? PeTA never advocated violence? And we are talking about the largest animal rights organization in the world. Yes, HSUS has a formal statement against violence (although I invite you to find it in their web site.) I don’t know of any other organization (aside form yours) that has adopted a formal position on this issue. I would appreciate you pointing to those that have one and where can I find such statements. Incidentally, a HSUS representative was at the AWA meeting when I proposed having a national panel on the topic. Her response was that HSUS will have pre-conditions for participation. Not the best way to respond to an invitation to initiate some meaningful dialogue. I think it is perfectly valid that you have suggestions as to how to change existing regulations or how to balance the funding between ongoing research and the development of alternatives. I also accept that your threshold in the assessment of cost/benefits of any one experiment may be different than mine. The most productive way for society to discuss such issues is to think about what kind of experiments we, as a society, deem permissible given today’s science and our moral concern for the well being of the animals. At a recent NIH symposium on the AWA I proposed exactly that — to have such a discussion with the creation of a national panel on the topic. Finally, and speaking for myself, I am against the use of animals in research that has no obvious scientific or medical goals. I agree animals should not be killed to develop a new eye mascara or a new lipstick. The problem is that having a civil conversation is difficult when we have to look under our cars for firebombs every morning. Or when our children are targeted because we express our support of animal research. Your condemnation of violence is duly noted… but more needs to be done to create an atmosphere of dialogue. And this is not exclusively our job. I don’t think you would find many researchers or animal care staff that are in favor if causing undue pain or suffering. To the best of my knowledge any procedures that are considered to cause more than “momentary” pain have to use analgesia or anesthesia or justify why it can’t be used. I agree that some research may seem unnesdary. I always thought of Viagra was in that class. But there was a recent story that another researcher was using Viagra to study the prevention of premature babies. Perhaps an unintended happenstance, but a good thing I think. I think we’ve established we share the same ideals, that’s not the question. The question is simply if you find animal research immoral or not. You are trying to evade giving an answer. If you benefit from work that you deem unethical simply because “its the reality of the present” then you are being hypocritical. Your ending sentence seems to imply you may accept the charge after all because “there are worse things than being hypocritical”… and, not to be ignored and the real reason, because you can the enjoy the benefits of the research. I am familiar with the Three Rs and support the approach. “Animal rights” is a generic term that includes many different philosophies. Like “womens’ rights” and “gay rights,” it doesn’t mean the same thing to everyone within the movement, much less to people outside the movement who apply the label to activists. Animals have no legal rights whatsoever. All the laws that protect animals do so by constraining the action of human beings that is considered inhumane. Do animals have moral rights or natural rights? If humans have them, then other animals must also, by virtue of having having evolved one from the other (or having been created by the same cosmic force––whatever you believe). The issue, to me, is not what rights animals have but what moral or natural rights humans have to use and abuse other animals. Does might make right? That’s the old view, but the paradigm is changing. Looking at all things from a new vantage point presents moral dilemmas on all fronts: in issues of human rights as well as “animal rights.” We must live with and struggle through the realities of the present, but does that mean that if we articulate and aspire to ideals for the future that we are hypocrites? If so, then––as someone posted earlier––there are worse things to be than hypocritical. You don’t think animals used in research are “owed” the avoidance and prevention of pain? How do you draw from the words I wrote that I was implying it would have been better for a girl “to have died rather than benefit from the animal research”? You may be interested in knowing that my child was born with a brain tumor, which was successfully removed at Yale Hospital when he was 20 months old. No doubt the techniques that kept him alive were developed using animals. I did not choose for him to die rather than benefit from the research, but the experience made me all the more committed to the reduction of pain and suffering in research, because I grieve for all the animals who suffered––and so does my son, by the way. Are you familiar with “The three R’s”? It refers to Reduce, Refine, and Replace. It’s a concept heavily promoted in animal model research. For example, advances in imaging techniques (MRI, ultrasound, PET) mean that in many cases the number of animals used in an experiment can be reduced. Refine could mean finding a different procedure to accomplish the same goals that causes less pain or discomfort. Replace can mean either using alternatives such as cell cultures or computer modeling where applicable instead of animals. It might also mean using a less sentient animal model if one exists. So you see the study into reducing pain and suffering that research animals might suffer us actually spearheaded by those of us in the industry. It’s something we take very seriously. I’m very glad to hear your son is OK now. I’m being completely honest when I say that’s why many of us are in this field. I am sure I would find common ground with at least 90% of all the people involved in animal research in the U.S. and Europe today. I would classify myself as a radical animal rights advocate but not a “fanatic” or “extremist.” I hate no one and abhor the use of violence or tactics of terrorism (including threats, and “home visits” or other invasions of personal or familial privacy). More than once during my 40 years of involvement in animal protection I have taken positions deemed heretical by others in the animals’ cause, and a lot of animal rights and welfare people don’t like me because I always say what I think. But I have never come across an animal activist who expressed to me the view that animal researchers “hate animals” and I do not know anyone who imagines that large numbers of researchers “enjoy seeing [animals] suffer.” But, as you admit, there is pain for the animals in some research, and that’s what I think must be avoided and prevented––at tremendous cost, if necessary. Surely the animals are owed that. I’m going to have to disagree with you on your last statement. I met a man this summer whose daughter’s life was saved because of animal research. She had a very rare blood disease and would have died without the treatment developed through animal research. No “maybe she would have”, she was in critical care. She’s about 12. Your statement implies it would have better for her to have died rather than benefit from the animal research. I whole heartily disagree. Is there a chemical compound that hasn’t now been tested on animals? Even salt and pepper and common herbs and spices have been tested on animals––probably in LD50 tests, at some point. Traditional or folk healing substances and methods that were in use by humans for millennia have now been tested on animals. Many chemicals, including pesticides and herbicides, are being re-tested on animals because of demands made by mainstream environmental organizations. Some of you would insist that if people take aspirin, then they are benefiting from animal research, but many such substances (or the active ingredients) were in common use before they were studied in laboratories. We don’t really know what the state of modern medicine would be If research based on animal models of disease had not been compulsory for so long. That everything to do with modern medicine has had some association with animal experimentation is indisputable, but why does it then follow that animal advocates are hypocrites because they may both benefit from modern medicine AND want animals not to suffer? That animals have been utilized in developing pharmaceuticals and procedures that benefit me gives me all the more reason to want to protect them from pain or other misery. It seems to me that there are as many animal research extremists as there are animal rights extremists. These polar opposites want to color everything black or white. In recent commentary following the article posted on this site about alleged activist violence and “hate speech,” it was said that animal advocates do not understand the moral dilemma faced by animal researchers. Obviously animal researchers do not understand the moral dilemmas faced by animal advocates. You see, we do have something in common. The researchers I know want to prevent unmessary pain and suffering too. We work very hard to ensure that the animals in our care are treated humanely and with compassion. And if we can develop non-animimal models that’s great! Animal research is incredibly expensive. The animals that I’m responsible for are well cared for, provided environmental enrichment and we have three full time veterinarians and two veterinary technicians to look after their well being. They are not allowed to suffer unnessarily. Is pain and discomfort sometimes necessary? I think so. Cancer research can be ugly, but in my opinion absolutely necessary. I would live animal rights activist raise money for research into alternatives, but I dont think that happens often. In fact I think they talk about there being alternatives without either knowing what they are or understanding them. There is the huge misconception perpetrated by animal rights groups that we hate animals and enjoy seeing them suffer. It’s so stupid that it’s laughable…except that others believe them. Don’t forget that animal research helps non-human animals too. There’s a reason there are medications for distemper, Feline Leukemua, heart worm, and other diseases. Sorry for the typos. I still find it tough sometimes to type on my iPhone. Big fingers, little keys. It seems to me you find animal research scientific necessary but ethically undesirable. If this is the case we agree. You would be an animal welfarist (as we are), and not an animal right activist. Animal rights activists do not find animal research merely “undesirable”. They consider it unethical — after all, in their view, animals do have rights. If animals have rights they ought to be respected. If you consider a practice unethical you ought to oppose it and you cannot take refuge in its legality. Assume the law stipulated that your house must be kept clean by a black slave. Could you meaningfully argue that you are truly against slavery, and that the slave we see in your house is merely because the law says you should have one? I somehow doubt it. However, this is the same argument you use to walk away with the benefits of animal research which, as you now tell us, includes your son’s life. If you believe the use of animals in research and the testing of drugs in animals before they are marketed constitute unethical practices you should be ready to oppose them in any way you can, work actively to change the law, and live with the consequences. Yes, you must live with the consequences. We care about the animals. We care about their suffering. We care about finding alternatives. We care about our human patients. We cared about you son. If you believe otherwise you simply don’t know who we are. Why should anyone care if their opponents “make life choices that reflect their fiercely held views”? The meat-eaters of California have banned the consumption of meat from dogs, cats and horses, regardless of how the animals are raised, or whether or not they’re raised for food, so there seems to be plenty of hypocrisy to go around. There’s a similar ban in Texas – hardly a bastion of animal rights. Maybe we should ban hypocrisy if it’s so offensive. Then again, what IS wrong with hypocrisy? 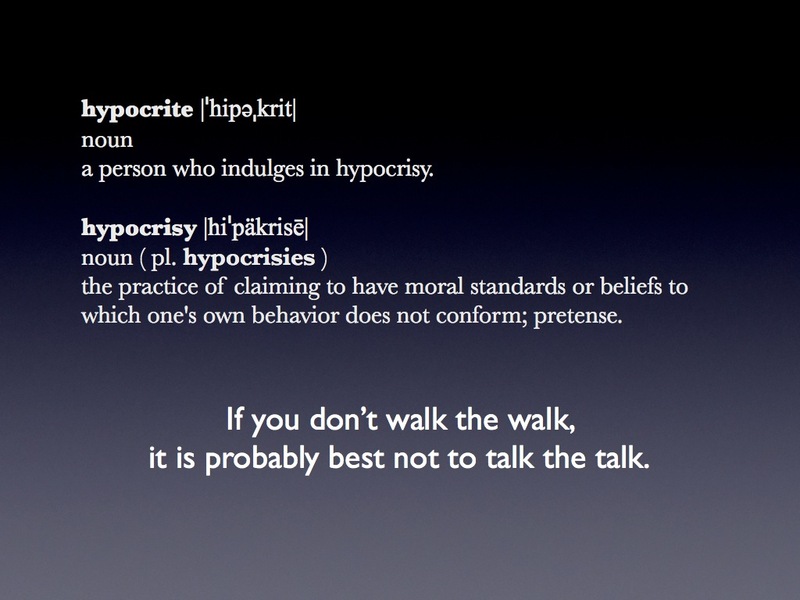 I know in many parts of the world “hypocrite” is such a dreaded label, but it just doesn’t seem bad or wrong or immoral or unethical. It’s certainly not rare or isolated either. I’m sorry, what’s your point here? There may be nothing wrong with hypocrisy if you keep it to yourself. You, as an individual, are free to behave in ways you deem unethical. It is your personal choice. The problem arises when the hypocrite tries to impose his (supposedly) moral principles on the rest of society. When the hypocrite wants everyone else to follow the same moral principles he conveniently ignores. It is wrong for a politician to condemn corruption while being corrupted. It is wrong for a man of religion to condemn sexual harassment while sexually abusing children. And it is wrong for animal activists to condemn animal research as immoral while accepting its benefits. So no, I do not care if others make life choices that are contrary to their views, so long as they do not impinge on the choices of others. Dario’s analogy is spot on, and it’s reflected in a real situations playing themselves out all the time. As one example, there are many people who believe that it is legitimate to consume animals and animal products for sustenance, but a large proportion of these people also believe in providing the best possible environments for farm animals. That is why proposition 2 passed in California and why many people voluntarily pay extra to buy food that is derived from “cage free” / “free range” / “pastured” animals, even though the cheaper alternative is present. They make life choices that follow from their beliefs, even though there is a financial cost involved. In doing so, we make it profitable for animal farmers to attend to animal welfare. In the case of scientific research, we don’t need support from others to attend to animal welfare: we lead in this area. As Dario notes, every single alternative to the use of live animals in biomedical research was created by a scientist. We believe in animal welfare, and we vote with our feet by creating refinements, reductions and replacements for animal use at every turn. All we ask is that our opponents take the same decision and make life choices that reflect their fiercely held views. I’m a bit confused. So it’s OK for animal rights activists to harass and threaten animal researchers while they develop the beneficial situation AND it’s OK to then take advantage of the results? You don’t find that a bit hypocritical? So it’s OK to harass the investigator develping the MRI because he/she used animal models, but it’s also OK for you to use it if it means benefiting you. Nope, I don’t buy it. Sorry. I might understand if groups like PeTA and HSUS were financially supporting the development of alternatives, but they aren’t. It appears more pertinent to direct Daniel’s comment to the opposition. This commentary makes a valid point. Those that want society to live by their moral precepts must show they can live with the consequences. These people really can’t. If you object a practice don’t support it. I wouldn’t buy a product from someone who I know exploits children just because it is cheap. The above is not a justification for animal research. It is merely an explanation for why most animal rights activists are hypocrites. And you are wrong. We are for the development of alternatives, not against them. Scientists are in fact the ones that develop the alternatives, not animal rights activists. The idea that abstaining from a beneficial situation because the events that have allowed that situation to arise are morally objectionable, the central premise of all of the arguments above, is flawed. As is the idea that beneficial situation justifies the means. Furthering either of these positions, either by abstaining from a beneficial situation or justify objectionable practices due to their results, is counter productive to all concerned. Progress is always to be made by turning attention to root causes and investing time and effort into alternative methods that are less objectionable. Moreover, it has not escaped my attention that Mr. Bogle’s argument is nothing more than “if I am a hypocrite, so are you.” He is not truly denying his hypocrisy at all… he is merely trying to deflect the charge instead of answering it directly. So much for the supposedly superior moral reasoning of animal rights activists.